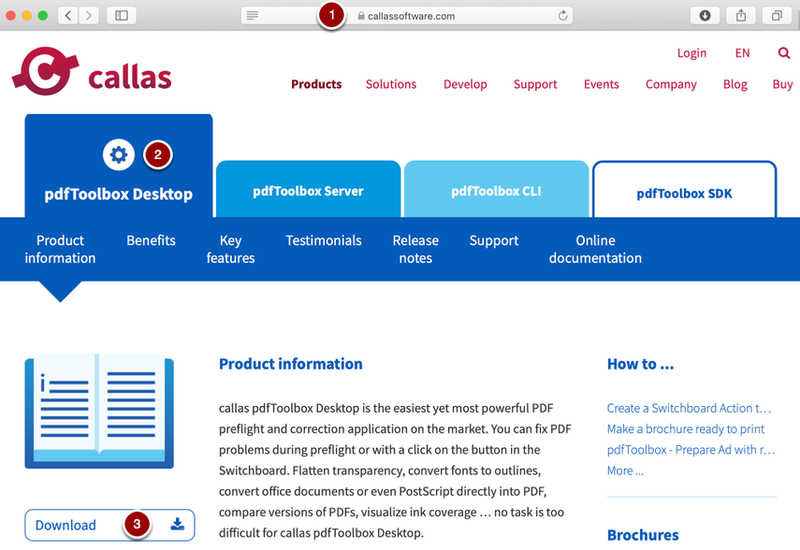 At the end of this manual, you should have a good idea of what callas pdfToolbox can do for you; but nothing beats trying out the software in your own workflow of course. Luckily callas provides a trial version that lets you do exactly that. Surf to the callassoftware.com website using your favorite browser. Hover over the "Products" menu. Click on the "pdfToolbox" item that appears. On the pdfToolbox page, scroll down until you see the tabs with the different pdfToolbox flavors. Click on the version of pdfToolbox you want to try (see the next section if you are hesitating which version to try). Click on the "Download" button to download your trial version. Fill out the form that appears with your details. Remember to enter a valid email address, as a download link will be emailed to that email address. If you are only interested in testing the interactive (or manual) version of pdfToolbox, download pdfToolbox Desktop. If you are also or only interested in automation using hot folders or command-line, download pdfToolbox Server (the server flavor includes both pdfToolbox Desktop and pdfToolbox CLI). If you are specifically looking to test on Linux, download pdfToolbox CLI on Linux and optionally download pdfToolbox Desktop for use on your Mac or Windows machine. If you are specifically interested in working with the SDK, download pdfToolbox SDK. Keep in mind that you will not get a direct download link but you will be contacted by us to help you with evaluating pdfToolbox SDK. Activate your trial following the instructions you find on the callas software support pages; take care to follow the procedure for the flavor you downloaded. Keep in mind you might have to run though the procedure twice (if you want to test pdfToolbox Desktop and pdfToolbox Server / CLI for example). The trial versions from callas are only restricted in time, not in functionality. Please make sure you have sufficient time allocated to testing before you activate your trial. In case you find that you need more time in your trial, contact callas through info@callassoftware.com to request a longer time-limited version.